Antoni Sarcevic's free-kick earned Fleetwood promotion as they defeated Burton 1-0 in the League Two play-off final. Fleetwood dominated the first half, but could not make the breakthrough, and then they had to watch as Burton imposed themselves on the game in the second half. 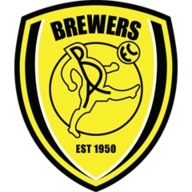 It was a game of few chances however, with neither keeper particularly busy and it took a mistake from Burton's number one Dean Lyness to settle an attritional encounter. Lyness allowed a long-range free-kick from Sarcevic (75) to evade his clutches to give the Fleetwood man his 15th goal of the season - and one of his easiest. David Ball almost fired Fleetwood into a dream early lead when he collected Iain Hume's attempted shot before turning smartly and shooting, only to see Lyness tip his powerful effort over the bar. And from the resulting corner Ball again came close when his header was hacked away from inside the six-yard box. Fleetwood maintained the upper hand, and first Matty Blair and then Ball had penalty appeals rightfully waved away be referee Michael Naylor. Blair was challenged in the box by Robbie Weir, but Weir timed his tackle to perfection to get the ball and then seconds later Ball went down after a collision with Shane Cansdell-Sheriff. Lee Bell tested Chris Maxwell from 25 yards, but the Fleetwood keeper was equal to it as Burton attempted to get a foothold in the game. Ball was back at the centre of things for Fleetwood just before the half-hour mark when he collected Connor McLaughlin's pass in the area, but could not get his shot on target with a swarm of Burton defenders closing him down. Billy Kee wasted an opening for Burton 10 minutes into the second half when hesitant defending from Mark Roberts and Nathan Pond allowed Kee time to get on the end of a long ball, but he fired over the bar. Burton, who improved after half-time, almost took the lead when Cansdell-Sheriff met Chris Hussey's wicked corner kick from the left, but his glancing header flashed across the six-yard box. 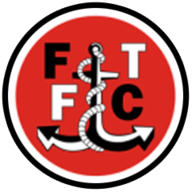 But with 15 minutes to go Fleetwood took the lead through Sarcevic's deep free-kick from the left, which was mis-judged by Lyness and ended up in the net despite the keeper's desperate bid to keep it out. It should have been a routine take for Holness but he lost the flight of the ball, with Pond challenging him, and the ball flew into the corner of the goal. Burton threw caution to the wind and sent bodies forward but Pond and Fleetwood stood firm to send the Cod Army into League One and their sixth promotion in 10 years.